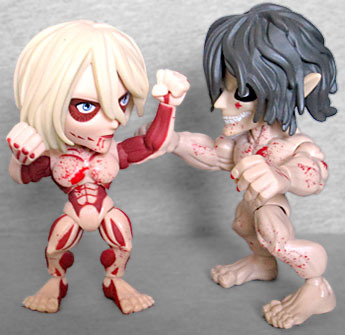 Eren wasn't the only "Build-A-Titan" Loyal Subjects put in its Attack on Titan blind boxes. When the Scout Regiment left the safety of the walls for a mission to the Shiganshina District, Eren's old home, they encountered a new type of Titan. This one had distinctly female anatomy, rather than the androgynous morphism Titans usually displayed, and it also quite clearly had a level of intelligence never before seen in the monsters: it decimated their cleverly designed patrol formation, knew how to avoid their standard attack strategies, and appeared to be looking for a specific person among the crowd. Considering that most Titans' thought processes fall somewhere on the spectrum between "Tony Robbins hungry" and "food goes in here," that was a terrific way to reinvigorate the threat Titans posed: yes, they're big and dangerous, but by that point we'd spent 16 episodes seeing the characters deal with them, so they'd lost some of their impact. The Female Titan brought it all back. The Female Titan is, like Eren's Titan, "piloted" by a normal human, and while we do eventually learn more about them, we're not going to spoil any of that here. (It's fairly common knowledge by this point, but hey, we're considerate.) 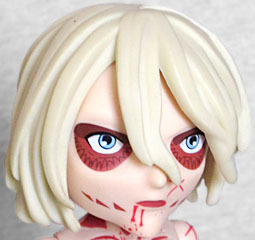 The stringy blonde hair is sculpted in big, stylized chunks, falling artfully between her eyes, which themselves are set in striated red sockets. There are three small red marks on each of her cheeks; though her mouth doesn't normally open as wide as Eren's does, she can tear it open when she needs to - those are score marks where her skin can rip when needed! Gross! As with the rest of the figures in this line, the Female Titan is done in a superdeformed style. She's slightly shorter than Eren was, and has more feminine proportions: thinner arms, a narrower waist... and yet her chest and hips are smaller than his. Eren Titan's got more of an hourglass figure than the Female Titan does! 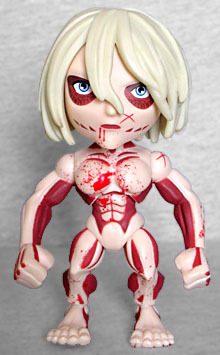 For what it's worth, Hajime Isayama (the guy who created the series) has said her measurements are 338-259-338, so if you got this toy and were really obsessive, you'd be able to figure out just how superdeformed it is. That said, they seem to have missed a very obvious idea for a variant: the Female Titan has the ability to harden her skin to something resembling diamond, both in durability and appearance; so why, for a variant, would you not take advantage of that? If you're not going to mold the arms from translucent blue and then paint skintone from the shoulder to the elbow, then at least paint the hands to look like she's turned them to crystal for extra punching power! Her skin is already pinker than Eren's Titan is, so a flash of light blue would have contrasted nicely against it. 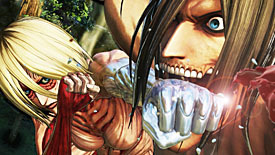 Several of the more important Titans are based on MMA fighters, and while the Female Titan may not have a direct inspiration, her fighting style resembles Muay Thai. The toy does have articulation (take that, Mystery Minis! ), but definitely not enough to get her into her fighting stance. She moves at the head, shoulders, wrists, torso, hips, and ankles, so you'll be able to have some fun, at least. And her hands are balled into fists, so she'll look distinct from Eren when they brawl. As mentioned last time, Loyal Subjects claims the Titans are available in a 1/24 ratio, which is just wrong: the head and body are packaged separately - making it easy to tell which two boxes contain them - but there's one complete Titan in every case of 12 boxes. I'll tell you, though, it took me a lot of tries to to find the Female Titan instead of Eren's (so if you were a Toys For Tots kid last year and scored some Attack on Titan Action Vinyls, that's why). I first heard of Attack on Titan when my anime-loving friends were getting into it while it was still only in Japan - all I knew was the name, so I was expecting giant robots, not Robbie Williams' "Rock DJ." 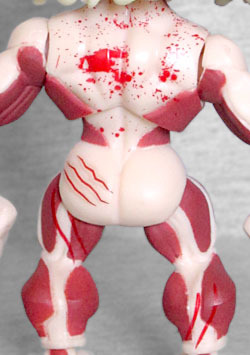 I'm into it now though, so I'm glad somebody made a Titan toy, even if it's not my ideal version. I'm just sad there will probably never be a second series, with the Armored and Colossal Titans (yes, even if they were only 5" tall, too).